Patty's elbow x-ray was normal but the pain persists. It most likely is some type of muscle or tendon issue. We took a retreat this weekend with my cousin and his wife. This required us to spread the kids out among three close friends of ours. It was a great time except for the fact that it went by way too quickly. With Patty's lymphedema appearing to be under control we'll probably start to look into her reconstruction options. 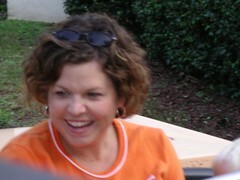 Patty has a check up today with her Medical Oncologist (chemo doctor). She has been having a quite a bit of pain in her elbow of which I'm sure he is going to want to do tests on to see what is going on. It could be related to the lymphedema or something else. I will let you know after the check up. Until then pray that her elbow pain will improve. Outside of that she has been feeling pretty good and her hand and arm have had some improvement. Once we exited the airport doors I immediately knew that we were indeed in a 3rd world country. People everywhere grabbing at our luggage, shouting, disagreeing. Since I had never experienced an environment where people were shouting in a language I couldn't understand, it was a little disconcerting. I became further concerned when a guy grabbed the cart of luggage I was pushing that had my carry-on on it. I think he was just trying to get us out of there but at this point my trust level was running a little low. Finally, they got us to an area where our transportation was and begin loading our luggage into the truck. Confusion still reigned as we waited for Bryan and Pastor Juste's people to tell who was riding in which vehicle. Some were on the back of the luggage truck, some in a van (referrred to as the MiniBus), some in a SUV, and me, Mark Johnston, and Luke the missionary in a very small SUV pulling up the rear. As we exited the airport lot it was now dark and I noticed two things, no lights and people freakin' everywhere! Truly, I'm not sure I can accurately describe it. Ladies walking with huge baskets on their heads, rubble everywhere, trucks (called tap-taps) were packed like sardines with people packed in the back some hanging off with one arm. They would be known as taxis in our world. Although nothing like we've every seen. Many of them are unbelievably decorated in colorful pictograms, flashing lights, and images from Jesus to women posing on Mercedes. 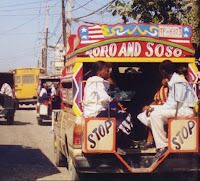 The car horn appears to be the Haiti national anthem as it is used early and often. There are seemingly no driving laws as its every man for himself. People are sitting out in the front of their shanties or business by candlelight selling what appears to be some type of fried meat. It looks like its been there a while. Huge vats of what appeared to be chicken or pork. My recurring thought was I hope the car doesn't stop. Luke, a full-time missionary in Haiti had joined us at the airport for the trip and he was sitting in the back in between me and Mark Johnston. Our driver Rico is Pastor Juste's son. Our front seat passenger, thankfully, is a full blown member of the Haiti Elite National Police. He was decked out with your usual assortment of grenades, hand guns, and automatic rifles. I was very thankful he was riding in our car especially once the car did stop. He would get out and people would move out of the way and immediately the traffic would clear.